In the neon-bathed city of Hong Kong, a grisly murder has taken place. You and your fellow Investigators arrive at the scene of the crime to discover that the culprit has left important clues. From among the suspicious objects scattered around, you must deduce the "Means of Murder" and identify the "Key Evidence" in order to catch and convict the killer. As if solving a murder wasn't tricky enough, this one is complicated by the fact that the killer is among the Investigators! While the Forensic Scientist gives Investigators clues on what to look for, the Murderer attempts to sow confusion and doubt in order to cover their dark deed. 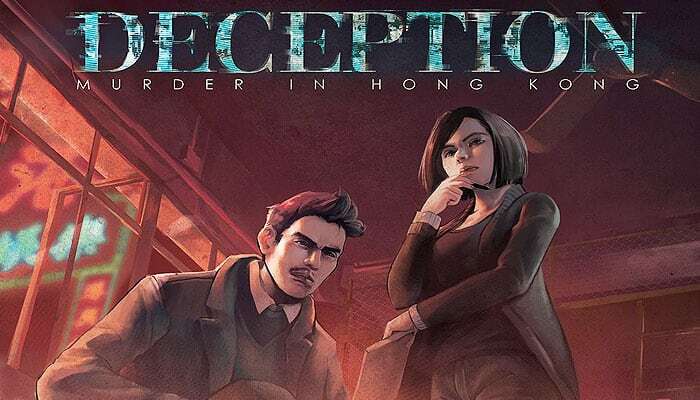 Will the Investigators be perceptive enough to successfully solve the crime or will the culprit(s) accomplish the perfect crime and get away with murder? As the game master, the Forensic Scientist holds the solution to the crime. They are responsible for assisting the Investigators in identifying the "Key Evidence" and "Means of Murder". When an Investigator does that successfully, the crime is solved and the Forensic Scientist and the Investigators win the game. When the crime takes place, the Murderer chooses 1 Clue card and 1 Means card as the solution to the crime. These will be the "Key Evidence" and "Means of Murder" respectively. The Murderer tries to hide their role and look for a scapegoat. Even if they are identified, the Murderer still wins the game if no one correctly identifies both the "Key Evidence" and the "Means of Murder". To solve the crime, the Investigators must analyze the hints given by the Forensic Scientist. As long as one of the Investigators correctly identifies both the "Key Evidence" and "Means of Murder", the Murderer is arrested and the Investigators win the game as does the Forensic Scientist. Bear in mind that the Murderer (and sometimes Accomplice) is among the Investigators! The innocent Investigators must make a vigorous effort to defend themselves from false accusation. The Accomplice is an optional role for games with 6 or more players. He or she knows who the Murderer is, as well as the solution to the crime. The Accomplice and Murderer both win if the Murderer gets away with the crime. The Witness is an optional role when playing with the Accomplice. The Witness is an Investigator who has witnessed the culprits leaving the crime scene. They have no way of knowing which is the Murderer and which is the Accomplice and they do not know how the crime was committed. If the Murderer is arrested but can identify the Witness, the Witness is considered to be killed, allowing the Murderer and the Accomplice to get away with murder and win the game. Return to the game box all Event tiles, which are used as a variant. Deal 4 Clue cards and 4 Means cards to each player. The players display their own 8 cards face up in front of themselves, with the texts and graphics facing the other players so they can all be seen. Players should take a moment to glance through all the Clue and Means cards on the table. The graphics on the Clue and Means Cards are for reference only. Players should use their imagination based on the texts. Return the unused Role cards to the game box. Shuffle the Role cards to be used and give one to each player face-down. The player receiving the Forensic Scientist card reveals; their identity and acts as the game master. They discard their Clue and Means cards and will play using the Scene tiles instead. All the other players keep their roles secret. In your first game, it is recommended to assign the role of the "Forensic Scientist" to the most expressive player. Finally, give each player (except the Forensic Scientist) a badge token. This token indicates a player has not yet attempted to solve the crime and should be clearly displayed in front of the player. Return excess tokens to the box. 1a. The Forensic Scientist announces, "Everyone, close your eyes", and confirms that all eyes are closed. 1b. The Forensic Scientist announces, "Murderer (and Accomplice), open your eyes", and confirms that they have done so. 1c. The Forensic Scientist announces, "Murderer, indicate the 'Key Evidence' and 'Means of Murder.'" The Murderer then points to one of their Clue cards and one of their Means cards. 1d. The Forensic Scientist gives the Murderer a nod of acknowledgement, at which point the Murderer can stop pointing, and then announces, "Murderer (and Accomplice), close your eyes". 1e. (Only if there is a Witness in the game) The Forensic Scientist then continues, "Witness, open your eyes", and then indicates the Murderer and Accomplice by pointing to them. The Witness then gives a nod of acknowledgement, after which the Forensic Scientist announces, "Witness, close your eyes". 1f. The Forensic Scientist announces, "Everyone, open your eyes". This is the main part of the game and is divided into 3 rounds - each round consists of an Evidence Collection phase and a Presentation phase. The game may end prematurely when any one of the Investigators correctly identifies the "Key Evidence" and "Means of Murder". To prepare for this round, the Forensic Scientist sets aside the tiles entitled "Location of Crime" and "Cause of Death". They then shuffle the remaining Scene tiles face down to form a draw deck. 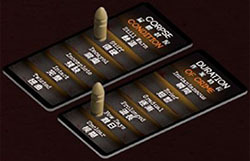 The Forensic Scientist selects one of the set-aside "Location of Crime" tiles, draws 4 random Scene tiles from the draw deck, and displays these tiles, together with the "Cause of Death" one, in front of themself. One at a time, the Forensic Scientist places each of the 6 Bullet markers on the tiles in front of them. Each marker must be placed on one of the six items listed on the tile and only one marker may be placed on each tile. They can be placed as quickly or as slowly as the Forensic Scientist would like. After the placement of the first marker, all players but the Forensic Scientist can freely discuss and express their opinions about the investigation. The Forensic Scientist places the subsequent markers based on the discussion, so as to narrow down the investigation. Therefore, the order in which the Forensic Scientist chooses to places the markers, as well as any signs of decisiveness or hesitancy on the part of the Forensic Scientist, can be clues. The markers can be . placed in any order, but they cannot be repositioned once they have been placed. This step concludes as the sixth marker is placed. After the final marker has been placed, the Forensic Scientist should allow a brief period for discussion of the evidence and then ask each player to present their opinions about the crime. Starting with the player to the left of the Forensic Scientist and continuing clockwise, each player should present their opinions about the "Key Evidence" and "Means of Murder". Each player may take about 30 seconds. (This is just a guideline. You may adjust the time limit as you see fit). The players are not allowed to interrupt or disturb the player making their Presentation, EXCEPT to make an attempt to "Solve the Crime". After each player has had a chance to present their opinions, the Forensic Scientist moves on to the second round of Evidence Collection. The Forensic Scientist draws a new tile from the draw pile. This tile replaces one of the previously used Scene tiles except "Location of Crime" and "Cause of Death". To replace a tile, remove the marker and discard the tile. The newly drawn tile goes in the empty space and the Forensic Scientist places the previous marker on one of the six items listed on the new tile. The Forensic Scientist should give the group a moment to discuss the new evidence before again calling on each player to present their opinions as in step 2a-II. After each player has presented their opinions a second time, the Forensic Scientist moves on to the final round of Evidence Collection. Important: The game ends immediately after the last player's third and final presentation. Other than the Forensic Scientist, every player, including the Murderer (and the Accomplice) can make one single attempt to "Solve the Crime" at any time during the game. To try to solve the crime, a player should announce, "Let me Solve the Crime!" That player then points to one Clue card and one Means card in front of another player. 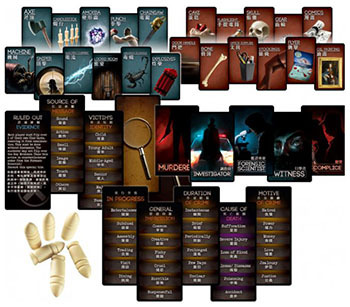 If the cards chosen when a player attempts to solve the crime are the correct "Key Evidence" and "Means of Murder", the game ends immediately and the Forensic Scientist and Investigators (as well as the Witness) win. If either of the cards is incorrect, the Forensic Scientist will only say "No" without giving any additional information. If a player has attempted to solve the crime incorrectly, they must surrender their Badge token to the Forensic Scientist, indicating that they have used their one attempt to solve the crime. They continue to participate as normal and may still present during all Presentation phases but may not make another attempt to solve the crime. Important: If you do not make an attempt to solve the crime before the last player's third and final Presentation, you will lose your chance to do so. Use it. Don't lose it! An Investigator attempts to "Solve the Crime" and correctly chooses the "Key Evidence" and "Means of Murder". In this case, the Forensic Scientist and Investigators (as well as the Witness) win the game! All players have lost their chance to solve the crime (either because they made an incorrect guess or did not attempt to "Solve the Crime" by the end of the third and final round of Presentation). In this case, the Murderer (and Accomplice) win the game.